The King & The Warlord add-on announced. 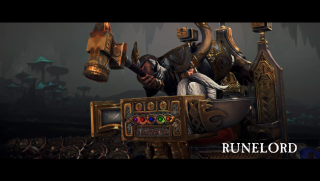 Total War: Warhammer's first 'Lords' pack bolstered both the Empire and the Vampire Lords with a couple of new champions—the Empire’s Volkmar the Grim, and the Vampire Counts’ Helman Ghorst—while the second will do the same for the Greenkins and the Dwarfs. The King & The Warlord, announced below in a new trailer, will introduce Greenkin Legendary Lord Skarsnik, and the Dwarfs' Belegar Ironhammer, along with new units, maps, quest chains and other bits. The add-on is comprehensively detailed over on its Steam store page, but know that it includes Dwarfen Runelords, Night Goblin Warbosses, cute little Squigs, Dwarf Rangers and a few other units. It's out on October 20, and it'll set you back £5.99/$7.99.